Madden NFL, MLB The Show and NBA 2K continue to sit well atop the sport video game heap, each bringing something distinct and special and deep to the genre. EA Sports’ NHL franchise isn’t nearly there yet, but that doesn’t mean it’s not plenty of fun. NHL 18 may not be a dynamic, game-changing sports game, but it is a good, fun one. In many ways it’s a throwback sports franchise, one that delivers workmanlike efforts in the classic modes you expect, along with a throwback mode that delivers some arcade-y sports gaming. It’s a formula that’s engaging for NHL fans, and accessible to newcomers. The core game is nuanced, strong hockey. 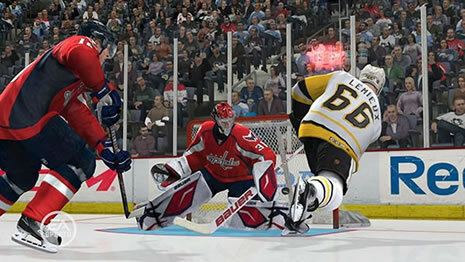 Ever since the PS3/Xbox 360 era, EA’s NHL franchise has featured some of the most challenging play in sports gaming, as you simultaneously control both the locomotion of hockey players and their stick-handling. It requires coordination and smarts; there is no repeatable sports game hack, even at the lightest difficulties of NHL 18. It takes awhile to learn that, as well as the processes and timing of line changes, especially if you’re not a hockey fan. Fan or not, you’ll find things easy to learn in NHL 18, thanks to a new NHL Training Camp mode, which lays out the fundamentals of the game in digestible fashion. Whatever you learn, you can take it into the standard modes you know well. Franchise, Season and Be A Pro career mode are all here and well-executed. There’s not much new in either mode, and the feature sets pale in comparison to, say, Madden, which now tries to tell a story in its career mode, and NBA 2K, which has you, as the owner/GM of a team, voting on game-impacting rule changes in between seasons. That depth is absent here, but in a way, that’s refreshing. There’s no hokey, overtold story here, so you simply aggressively engage in potently developing your character. Playing this career mode is actually fun, a reminder that sports games don’t always need to tell stories (especially if those stories aren’t any good). Be a Pro is simply your immersive experience into developing a pro hockey player. NHL delivers an even more throwback mode in the arcade-y “Threes.” Think of this as a fusion of NBA Jam and classic NHL hockey; you’re playing with all the nuanced controls, but the game is stripped down to 3-on-3 ice action, with simpler rules to facilitate swifter play. There are power-ups and other little bits, too, even unlockable mascot play, and that all makes the game play faster and more electric. It’s a smart changeup from everything else in the package, with surprising depth: You can play through a campaign mode in Threes as well. It’s all a solid sports video game package from a quietly solid sports video game. NHL 18 isn’t destined to go down as one of the greatest sports games you’ve ever played, but make no mistake about this: It is solid fun.